The classic filigree heart charm has been revitalised in a blazing cerise hue. For many, the PANDORA Cerise Encased in Love Charm (N0. 792036NCC) is the highlight of the PANDORA Valentine’s Day 2017 collection. Sterling silver filigree hearts form a pretty pattern over a cerise pink crystal, creating a fun and fresh take on the classic heart. The PANDORA Openwork Heart Charm (No. 790964) is a classic PANDORA charm and was one of my first charms. When I first saw the PANDORA Cerise Encased in Love Charm I loved how such a classic PANDORA charm was revamped with such a stunning colour. Often the PANDORA Valentine’s Day Collections are full of lots pale pinks but the vibrant cerise crystal in this charm makes it stand out from the crowd. 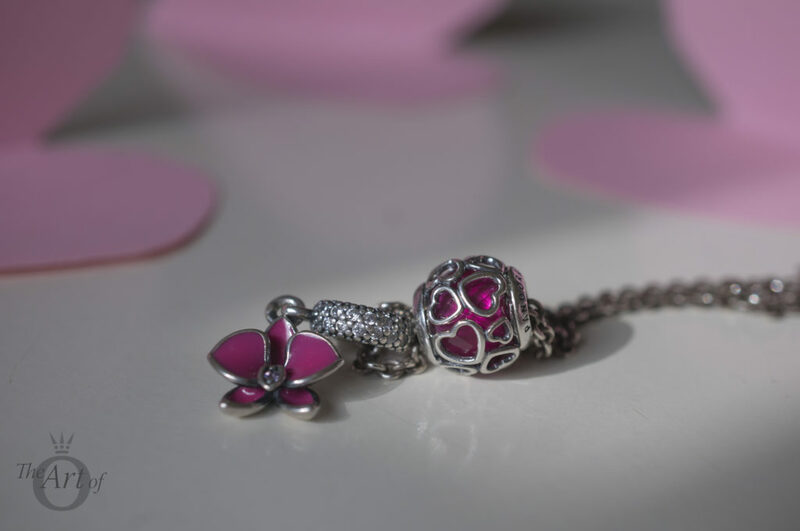 The PANDORA Cerise Encased in Love Charm is very true to the colour of it’s stock image. In real life you can see the cerise crystal has lovely facets which sparkle and catch the light from within the cage of the filigree hearts. The Cerise Encased in Love Charm is a threaded charm and feels substantial to hold. For my first styling of the PANDORA Cerise Encased in Love Charm I choose a mostly silver selection with a dash of bright pink from the Eeyore charm and a pair of Shoreline Sea Glass Murano Charms (No. 791608). The Shoreline Sea Glass Murano Charms are so versatile and add a fantastic colour pop. Unfortunately they are retired in some countries but are still available from BeCharming.com for $50. If you are interested to see more style options of the PANDORA Disney Eeyore charm, make sure to read my review on the delightfully gloomy fellow! As I previously mentioned the PANDORA Openwork Heart Charm was one of my first PANDORA charms. 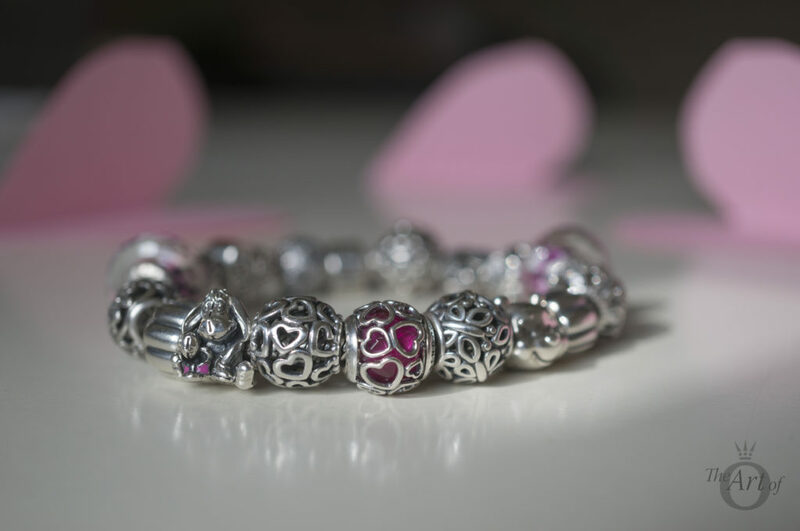 I also just recently received my first PANDORA Rose charm, the Open Your Heart Charm (No. 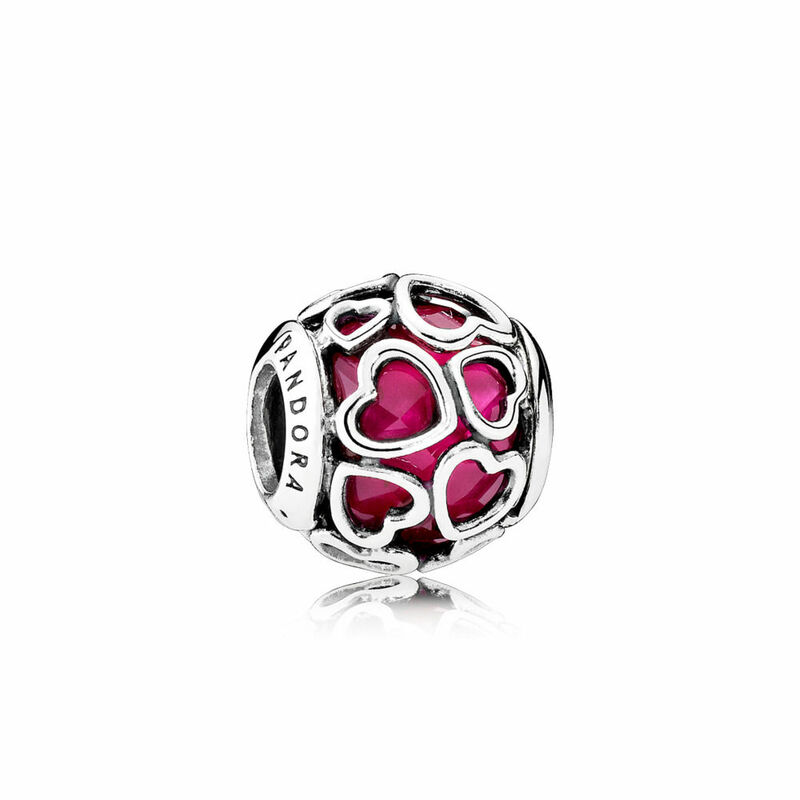 780964) and I thought it would be cute to style the two charms with the new PANDORA Cerise Encased in Love Charm. The cerise crystal looks amazing next to the PANDORA Rose charm and I think it would work well worn along with other PANDORA Rose charms. I had a little fun wearing the PANDORA Cerise Encased in Love Charm and the PANDORA Pink Lace & Heart Charm together by twisting the Light Pink and Honeysuckle Pink Double Leather Bracelets together. For me this styling feels happy, cute and full of love. Perfect for this time of year. The cerise crystal is also a perfect match for the Honeysuckle Pink Double Leather bracelet. I love it when I can wear my PANDORA charms on a PANDORA necklace as well as bracelets. 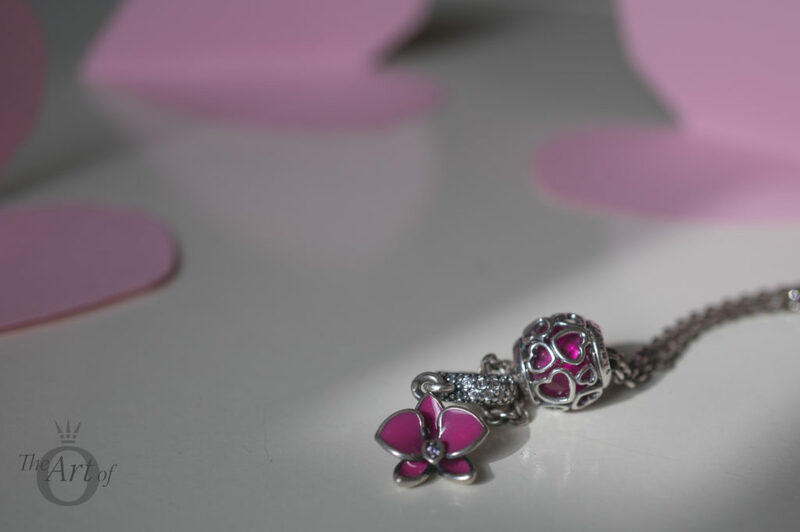 The PANDORA Cerise Encased in Love Charm looks fresh and summery worn on a necklace along with the Orchid Pendant Charm! My verdict on the Cerise Encased in Love Charm? I'm in love! 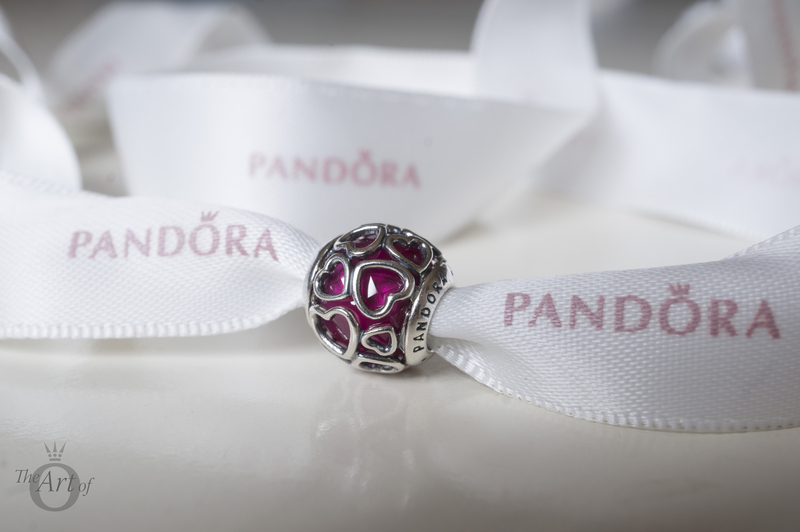 The PANDORA Cerise Encased in Love Charm (N0. 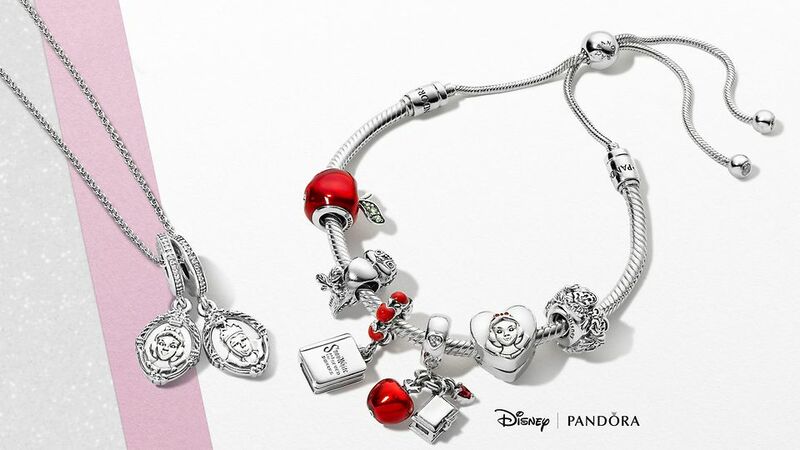 792036NCC) is £55 / €59 / $65 and is available from our preferred retailer BeCharming.com along with the rest of the PANDORA Valentine’s Day 2017 Collection. 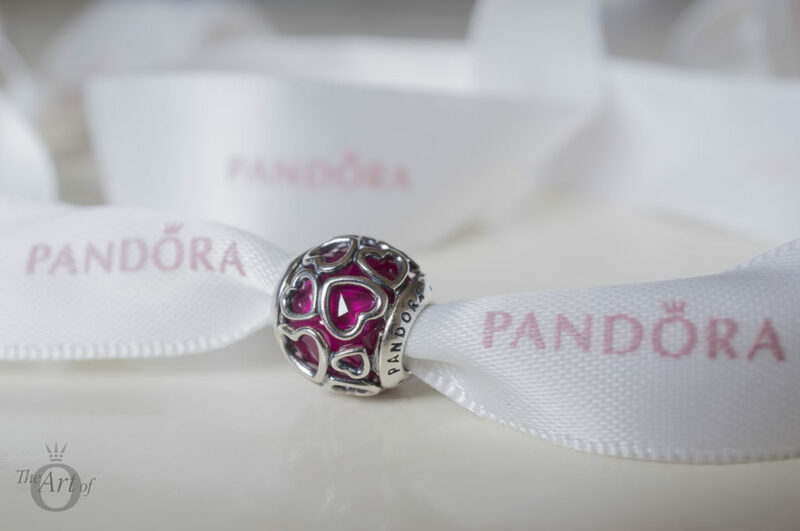 Do you have the PANDORA Cerise Encased in Love Charm or is it on your wishlist? Let us know how you style it in the comments below. Awesome review @theartofpandora ??? the cerise charm is adorable. Very chic ?? I especially loved how u have styled the cerise charm with the orchid charm ? that’s something I would have never thought of. Bravo ? Thank you for your sweet comment. The Cerise Encased in Love charm looks fantastic with the Orhid pendant, doesn’t it? It would look great with yours. Maybe you can make a few hints! ? Wonderful review! I particularly love the styling of the Cerise Encased in love charm on the light pink leather bracelet and the Pink Lace & Heart charm on the bright pink leather bracelet. Definitely eye catching and unique! Thanks for sharing your review! 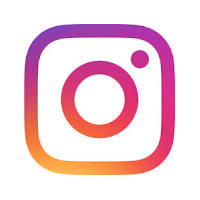 Thank you for your kind comment. That is one of my favourite stylings too. It looks so fresh and fun! The leather bracelets are great fun to play around with creating new ways to wear charms. Even though I´m not fan of leather bracelets, I like your design of combining the two colours. And I really love the encased in love charm with the orchid together. The first one I´ve just bought yestarday. Now I´m tempted to go for the orchid as well. I hope I could find it in outlet store.